Let Southern Cross guide you to that restful retreat you’ve been searching for. This luxurious oceanfront home in the upscale Hatteras Landing development is the perfect base for any adventure you desire, steps from the beach and marinas and miles away from the cares of the world. Enter on the ground level through the garage, where you can stash your beach umbrellas and boogie boards in between trips to the sand. Friendly competition awaits in the game room with pool table, TV, and full-size refrigerator. 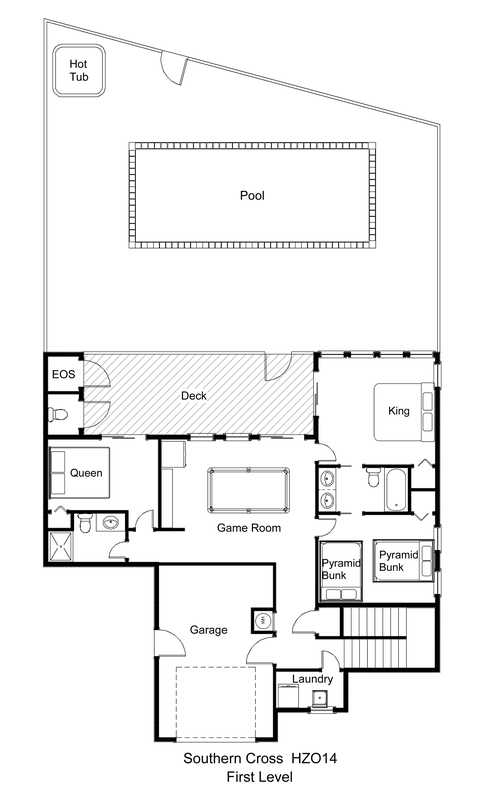 Off the game room, a bedroom with two pyramid bunk sets shares a Jack-and-Jill bath with a king bedroom with access to the shaded deck. 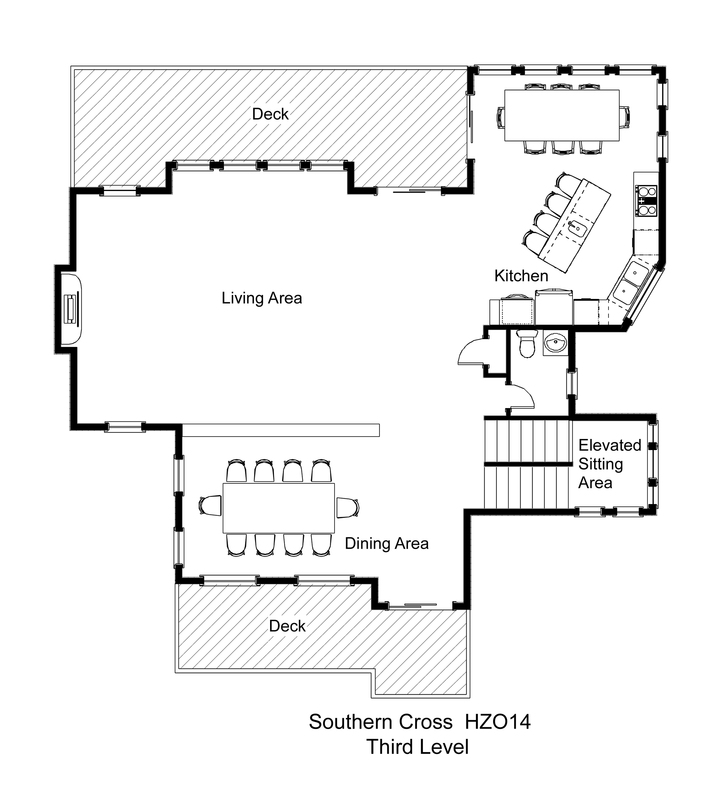 All bedrooms throughout the home have TVs. 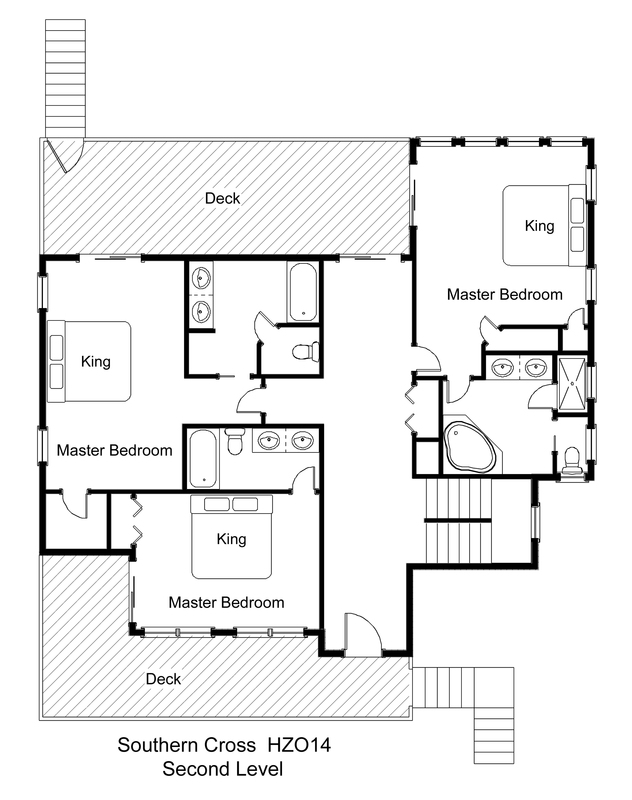 A queen bedroom off the other side of the game room also opens onto the deck, which holds the outside shower and a separate lavatory for quick trips from the pool area. A full bath with shower stall and the laundry area are also on this level. Three roomy king master bedrooms are on the middle level, each opening onto shaded decks where you can breathe easy in the ocean air. Two bedrooms, including one with a separate Jacuzzi tub and custom tiled shower in the private bath, open onto the shaded oceanfront deck with gated stairs to the pool area. The third bedroom features a Jacuzzi tub-shower combo in the private bath and opens onto the front deck with views of the sound over the nearby marina. Indulge your senses in the open living, dining, and kitchen area on the top level, boasting ocean-to-sound views throughout. The upscale kitchen with bonus wet bar sink at the breakfast bar features dual wall ovens and dishwashers so meal prep and cleanup are sure to be a breeze. A freestanding ice maker in the kitchen will keep your cooler well-stocked and your cocktail hour a blast. Enjoy casual dining at the oceanfront breakfast table or family feasts in the formal dining area with stunning sunset views. Catch up with family and loved ones in the living area, where you can curl up in front of the gas fireplace in winter. Watch breathtaking sunrises and unparalleled sunsets from the oceanfront sundeck and covered soundview deck. Retreat to the cozy loft for even more horizon-to-horizon views. A half bath completes this level. Make a splash in the private pool or stargaze from the relaxing hot tub. When you’re ready for sand between your toes, hit the beach via the boardwalk directly behind the home, shared with just one other property. Stroll to two nearby marinas for charter fishing, shop and dine at Hatteras Landing, or enjoy a scenic walk along the community wetlands boardwalk. The Graveyard of the Atlantic Museum and the ferry to Ocracoke are also close at hand, along with all the fun and excitement that Hatteras Village has to offer. Southern Cross is the perfect spot for your next Outer Banks vacation. Note: Owner offers a 10% discount on the charter boat Chaser Sportfishing. For the 2018 season, pets are not permitted in this home. Just wondered if you could tell me if this house has beach chairs for renters or should we bring our own? Southern Cross does not have an elevator. Are small dogs allowed for the 2019 season? Pets are not allowed in this home. I would give this a 4.5 star rating if that was an option. great location...was wonderful to watch the sunrise and sunset from the house! could walk to shops and restaurants. Spacious. Nice pool. Easy beach access. Home met and exceeded our needs. Very clean and well maintained. Nice pool and hot tub with good access to beach and ocean. The location of this home is perfect. It is on the beach and right across the street from Hatteras Landing and the ferry to Ocracoke. The house is nicely decorated with top of the line appliances and plenty of seating for a large group. House has a great location just needs a little cleaning up..